You will earn 2,120 Reward Points. Earn 1 reward point for every 1 dollar spent. 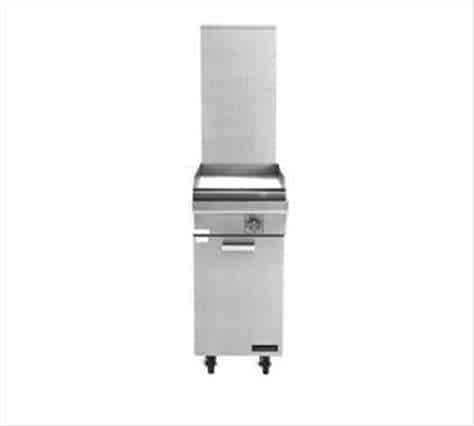 The 1" (25mm) thick steel griddle plate is 17" wide x 24-3/4" deep, (433mm x 629mm) and bordered by side and rear continuous-welded stainless steel splash guards. The 33,000 BTU, (9.67 kW), "H" burner controlled by a thermostat provides uniform heat. Heavy gauge aluminized steel radiation baffle requires no fire brick, heats evenly, increases thermal efficiency. Natural or propane gas, Model M8T. NOTE: Attachments supplied with casters must be installed with an approved restraining device.